Description: The flowers are clustered in the leaf axils. The individual flowers are small, 2-lipped, and have 5 lobes. The leaves are woolly, grayish green, opposite, and oval in shape. The leaves vary depending on moisture, becoming smaller and grayer in dry conditions. 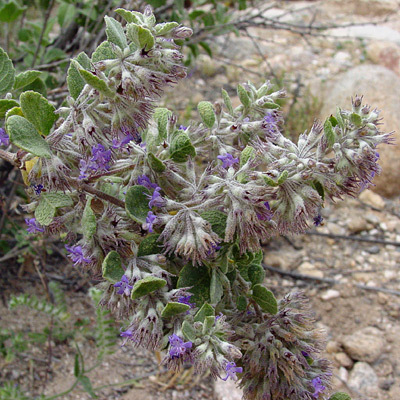 Butterfly Plant – The flowers attract butterflies and bees. 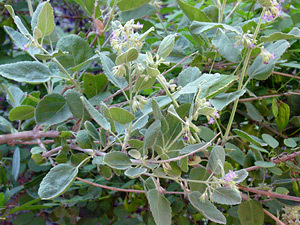 Edible – The leaves are edible and can be used to flavor tea. Fragrant – The leaves have a strong, pleasant, lavender fragrance when crushed. The flowers have only a faint fragrance of honey.